Floods and droughts are now devastating large areas of America, providing more evidence of the disastrous impact of climate change. But legislation to attack the buildup of carbon in our atmosphere has stalled as the energy sector has poured money into our elections, spending nearly $100 million just on the 2014 elections. That total doesn't include millions more invested by fossil fuel-backed "dark money" groups that conceal their donors. This is despite the fact that two-thirds of Americans acknowledge climate change is a problem. Kisha Baldwin lives with her daughter in Newark, New Jersey. Renting out part of her two-family home was one of Kisha’s primary sources of income. In the fall of 2012, Kisha’s house was severely damaged by strong winds from Hurricane Sandy. Her front porch fell apart and the lower level of her two-family home became uninhabitable. The federal agencies and contractors hired by the state were largely unresponsive to her. “Funds are not going to the people,” Kisha said. It’s gotten so bad that Kisha has to heat her home by running her gas stove. Today, Kisha is waiting on grants that were once guaranteed to her to fix her home. Kisha’s story is not unique. The earth’s changing climate is impacting the frequency and severity of extreme weather events like the one that caused severe damage to Kisha’s home. Ranchers and farmers have experienced extreme droughts, destroying their crops and sources of income. Business owners in southern Florida have had their stores flooded due to rising sea levels. Across the country, Americans are seeing the effects of climate change in their everyday lives. Despite a scientific consensus and growing recognition of the threats of climate change by business, military and government leaders around the world, many of our elected officials refuse to acknowledge the problem. “I’m not a scientist,” say many (mostly Republican) elected officials, including Florida Gov. Rick Scott and the new Senate Majority Leader, Mitch McConnell of Kentucky. Democratic Senator Joe Manchin of West Virginia famously released a television ad in which he was seen shooting a copy of the Obama administration’s cap-and-trade bill with a rifle. Then-Sen. Mary Landrieu (D-LA) even launched an effort for the U.S. Senate to approve the Keystone XL pipeline in a last-ditch attempt in her 2014 reelection campaign. She came up one vote shy. What these politicians have in common is the money they receive from the fossil fuel industry and the political power the industry wields in their states. The money pumped into American elections by big oil and polluter companies is staggering. 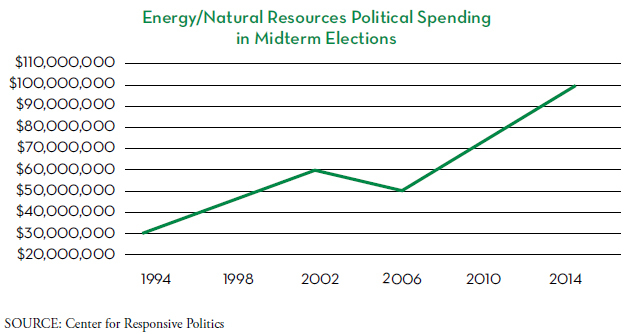 In the 2014 election, energy special interests spent nearly $100 million on federal elections, more than a $20 million increase from industry spending on the 2010 midterm elections. It should be no surprise that Koch Industries is the largest spender in this category at $6.4 million. Where does all this leave us? Two out of three Americans believe the earth is warming and support new emission limits for power plants, according to a Pew poll, but nine out of ten Republican leaders in Congress deny the problem even exists. In 2013, the Center for American Progress found that more than 58 percent of congressional Republicans were climate change deniers. Those same representatives reaped $58.8 million from the fossil fuel industry in campaign contributions. Increasingly, the industry is funneling its money through dark money groups that are not required to disclose their donors. Three groups in particular have led the recent political and electoral effort for the fossil fuel industry: the American Energy Alliance (AEA), the American Petroleum Institute (API), and the American Coalition for Clean Coal Electricity (ACCCE). Since Citizens United, these groups have spent millions on “issue ads” via TV, radio and print, targeting elected officials and their stance on energy issues. These groups aggressively exploit reporting loopholes, so we don’t know how much they spent on the 2014 election. However, their overall spending increased from $233 million in 2010 to $290 million in 2012. Shortly after the Citizens United decision in 2010, the American Petroleum Institute announced it would create a political action committee. In a 2011 interview, API’s executive vice president for government affairs Martin Durbin said it was “adding one more tool to our toolkit.” During the 2014 campaign, the American Energy Alliance launched political attack ads in several states, including West Virginia, Alaska and North Carolina. Other dark money groups fronting for the fossil fuel industry include the U.S. Chamber of Commerce, Karl Rove’s American Crossroads/Crossroads GPS, and the Koch brothers’ Americans for Prosperity (AFP). All have run attack ads in recent years dealing with energy and climate issues. Americans for Prosperity even launched a “Hot Air” tour in 2008 to campaign against “global warming alarmism” and “climate alarmists.” “If we win the science argument, I think it’s game, set, and match,” said AFP president Tim Phillips. The silencing of debate on climate change legislation — and the deep-pocket attacks on climate science itself — should serve as a loud warning about how powerful special interests and unlimited political spending can distort our democracy.